Automotive Electronics Market size is set to exceed USD 400 billion by 2024; according to a new research report by Global Market Insights, Inc. The development of intelligent vehicle technologies owing to the need for advanced safety & comfort parameters drives the automotive electronics market growth. These enhanced vehicular systems consist of several electronic components including smart sensors, powerful ECUs, mechatronic parts, etc., further generating a demand for automobile electronics. OEMs across the globe are focusing on developing advanced driving assistance and powertrain solutions to address road safety & fuel consumption requirements. As a result, industry players are concentrating on providing electronic components and systems depending on their requirements, further adding up to the automotive electronics market size. Growing government concerns regarding road & vehicle safety, traffic congestion reduction, and energy resource conservation across the globe are accelerating the automotive electronics market growth. The need to reduce vehicular pollution and consume lesser fuel in automotive vehicles has accounted for the emergence of electric & battery-operated vehicles in several countries including China and the U.S., among others. Moreover, several governments have started supporting developments in self-driving cars to avoid road fatalities and provide passenger safety, which is another factor accounting for the industry growth. Governments in Europe and the U.S. have permitted driverless vehicle testing operations for supporting the actual utilization of these vehicles on city roads, adding up to the automotive electronics market demand. For instance, in October 2018, the U.S. Department of Transportation and NHTSA have introduced several new guidelines for AV Testing and raised the safety concerns due to the accidents that occurred during testing operations. ADAS systems have also gained a substantial penetration in the automotive electronics market and will grow at a CAGR of over 9.5% owing to the safety & driving benefits provided by these systems. They consist of several features including blind spot detection, adaptive cruise control, night vision, etc., that aid while driving at night, in unfavorable weather conditions, and in distractive conditions. The inclusion of driving assistance systems offers advanced safety & control to vehicles and their drivers by providing airbags, automated brakes, and steering control features. These features along with the government policies aim at increasing automotive safety parameters, creating high adoption prospects for ADAS applications in the automotive electronics market. For instance, in September 2018, the Union Minister for Road and Highway Transport in India announced that Indian road safety will be increased by mandating ADAS for all cars by 2022. The passenger cars segment is experiencing a rapid growth in the automotive electronics market to reach over 85% revenue share by 2024 due to developments including safety & driving assistance, infotainment, etc. The newly developed passenger vehicles integrate several enhanced systems that offer advanced safety and luxury features to its consumers, further generating the requirement for automotive electronics market products. Moreover, the consumer demand related to luxury and comfortable vehicles owing to an increased spending capacity in countries such as the U.S., Germany, and India, among others is adding up to the passenger vehicle production. Additionally, commercial vehicles are also gaining substantial popularity in the market owing to the deployment of advanced safety, night driving, and engine control systems. These vehicles require robust and high engine management systems having several electronic components, further adding up to the industry demand across the globe. 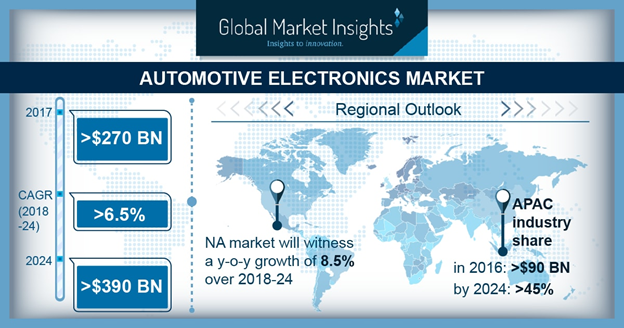 Asia Pacific region is growing at a rapid pace in the automotive electronics market owing to an accelerated growth in vehicle & related part manufacturing activities in countries including China, Japan, and South Korea. Additionally, this growth is attributed to the high penetration of automotive and electronics manufacturers in the region and increasing export activities to North American and European nations. The increased automobile consumption in India and China owing to the rapid population growth creates opportunities for industry growth. Europe automotive electronics market valued at over USD 80 billion in 2017 is also experiencing growth owing to the presence of leading luxury and passenger car manufacturers and a high demand for comfort and infotainment systems. The key players operating in the market include Bosch Group, Continental AG, Lear Corporation, Hyundai Mobis, Magna International, Altera Corporation, Delphi, Infineon Technologies, Texas Instruments, and ZF Friedrichshafen AG. Major companies are focusing on developing differentiated and efficient electronic systems such as ADAS and powertrain to gain a competitive edge. The automotive electronics market players also invest heavily in the R&D activities to develop technically advanced products regularly and address the growing consumer requirements. Companies have set up an extensive distribution and dealership network to cover local markets across the globe.